When you drive around Miami, you often see cryptic signs with arrows pointing down a particualr street. Those in the know know that these are signs for movie and TV production crews who are doing a location shoot. Today I had a few minutes and followed the signs into Gables by the Sea, a wonderful gated community at the border of Pinecrest and Coral Gables. When I arrived on location, there were food trucks, police and lots of neighbors mulling about. 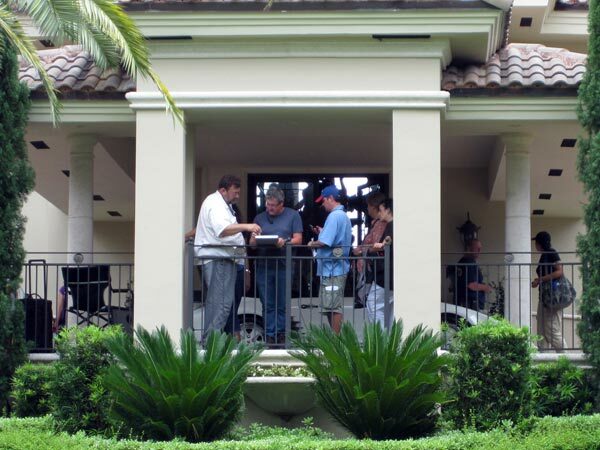 Inside one home was a full-scale feature movie crew shooting for Michael Bay's upcoming "Pain and Gain". If you look carefully at the photo above, you'll see a director's chair to the left, a beautiful white Porsche behind the production crew, and through the open front doors you can make out a film camera and tripod. At the time, Tony Shalhoub and Ed Harris were filming an interior scene. Due to tight Paramount Pictures security, I was unable to get any star-powered shots, but the crew was nice enough to tell me that this film will be release sometime in 2013. Starring Miami's own Dwayne Johnson, Mark Wahlberg, Ed Harris, Anthony Mackie, Tony Shalhoub, Rob Corddry, Bar Paly and more, the action film is just one of many that use Miami as its backdrop. An why not? Miami and its many incredible homes are a slice of heaven. The day before, they did an exterior shoot involving a street basketball game. The net is tucked away here with some lighting gear and another Panaflex camera.